But then I turned the television on. It was just before the second plane flew into WTC2. I knew then, that the planes were a lot bigger. Then I watched as the South Tower collapsed. Half an hour later I watched as the North Tower collapsed. It left me stunned, not really knowing what to do with my plans for the rest of the day. I had a meeting to go to in the evening in Mainz which was due to start a 7.30pm. I waited for the phone to ring or an e-mail to come, saying that it had been cancelled. But it didn’t happen. 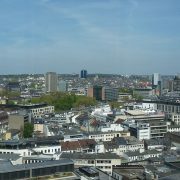 So not knowing what sort of panic might ensue on the roads around Frankfurt with its own sky scrapers, I got in my car at around 5pm and drove to Mainz. 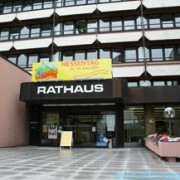 With over an hour to wait, I headed to Mainz-Lerchenberg near the ZDF studios and went into Media Markt. There, I stood with a group of maybe 20 people, just watching the rows of televisions and trying to make sense of what was happening. It was a strange feeling to be part of that group. The only thing that connected us was being in that store watching the coverage from New York. We didn’t really talk much either. And then the time came to go to my meeting, and it was “business as usual”. I don’t know if the others present had not heard about the attacks, but no-one spoke about it. We carried on with our meeting as if nothing had happened. Perhaps, just like me, the rest didn’t want to be the first one to bring up the subject. We wanted to get on with our work and get home again. 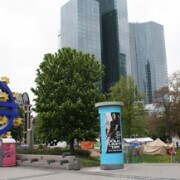 Almost immediately the events affected life in Germany, at least in Frankfurt. Very quickly, a rumour got out that the sprinklers in the tower blocks here only had a decent amount of water pressure up to the 10th floor if the main water pipes ruptured and the system relied on the fire brigade’s hoses. Just over a week later, I flew on holiday and was prepared for the tightened security at the airport. I decided to reduce my hand luggage as much as possible and put everything in the hold to make my security clearance easier. It made my suitcase slightly over the weight allowance, but at the check-in desk I pointed out my lack of hand luggage and everything was OK. Anything sharp, such as nail scissors, had to go in the hold anyway, but ironically there was a manicure set being advertised in the on-flight magazine. Obviously it had been too late to take the advertisement out, but one passenger asked if it really was available. And it was, although the stewardess thought for one moment, before removing then from the trolley. And then came the economic downturn. Whilst I was on holiday, the IT job market in Germany seemed to collapse. So much so, that when I turned up for my new job after I got back, I was turned away on my first day. I spent the next month job hunting, took the first opportunity that came up, and then spent another 6 months looking for something better. Each year, when the anniversary comes around, I think back to that day, and how it had an affect on my future career, if not on my life in Germany in general. Many of the recent security issues, either in air travel or in the IT industry, can be traced back to that day and the events surrounding it. The World changed, and even though I was not there and didn’t know anyone in the buildings or aeroplanes, my life changed with it.